One of the best garden helpers I know, the Italian honey bee, is an imperiled species. Those that remain are essential to agriculture as pollinators of almonds and a considerable number of fruits. Although many things have been suspected as weakening the honey bee, allowing their natural enemies to decimate whole colonies of these beneficial insects, there is still a lot of mystery and unanswered questions about what is really happening to them. Gardening is a science and an art. Because it is an art, there is no exclusively 'right' way to garden beyond water, light and a substance to hold the plants more or less upright. There are as many different ways to garden as there are gardeners and none of these is the Absolute Truth. 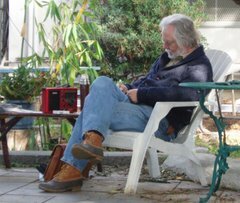 Most gardeners know this and so see themselves on a quest of learning to find the ways that work for them; they keep notes (on paper or in their head) from which they vow that next year will be better. As we age, some of us find 'on paper' essential while others seem to get more sanguine with age, but the art of garden journaling is a whole 'nuther post unto itself. Invariably, however, some, usually new gardeners, or even non-gardeners, feel they have found the Holy Grail of gardening and proselytize their new found Truth with all the fervor of a religious devotee. Condemning the Great Unwashed masses of other gardeners who haven't found this Truth, or, worse, violate it, the devotees alienate and isolate themselves from other gardens and practice their new found nirvana in groups of the like-minded or in solitude. Those of us who have gardened for a few years have seen more than one movement sweep the fancies of gardeners. In one of California's previous water crises of the late 1980's, everyone, including myself, became fanatical about native gardens – using our water saving native plants that are certainly more attractive and interesting (I thought then and I think now) than succulents or a 'lawn' of rocks. My favorite instructor of that time, Robert Smaus who wrote for the LA Times for many years, cautioned me that he had gone down that same garden path a few years earlier and felt he had been 'burned' when the whole thing shifted and suddenly California Natives were out and lawns back in. Though I did proselytize for our own native plants as ornamental gardens, I could never give up my love of veggies and fruit. So I was never a whole-hearted convert to natives. Natives, as Smaus predicted, went out of fashion again, although, they never faded completely away this time and I have remained on the outskirts of the movement cheering every lawn removed for food or for native habitat (which is really food for the native, and often endangered, wildlife that we overpopulating humans have helped destroy). We see California natives returning again with our current acute water shortages and, perhaps, with each successive wave, the planting of natives recedes less and less and the number of quiet native plant gardeners grows. The current Holy Grail is permaculture. I am interested in permaculture, I have a friend that says I am one. But I don't belong to any permaculture societies I see springing up, although I see permaculture can contribute ideas to how we garden (and it has certainly attracted a lot of gardeners, usually a reticent and non-congregating constituency, to gather together on a regular basis, that in itself an almost frightening unnatural act). I don't think permaculture is – or, for that matter, can be - the alpha and omega of food production. There are needs it cannot fulfill and there are places it will not suffice. I believe we all have a lot to learn from permaculture (the word is a marriage of "permanent agriculture") and in fact, would point everyone to a fabulous book, first published after WWI and republished in the 1950's that predates the current movement. J. Russel Smith's Tree Crops: A Permanent Agriculture (available from Amazon for $60 which is considerably more than I paid for it!) is a book far ahead of its time and should be required reading for anyone concerned with the state of the world's agriculture. As a tool in a kit box of tools that gardeners can use, one among many, I think permaculture should be included. 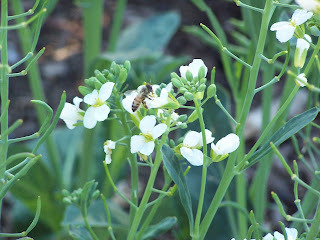 I have borrowed planting ideas and techniques from a good many of different ways of gardening and from that mix, I have forged a gardening style that works well for me. I continue to experiment and learn; and I also realize that a technique that failed here, might work there and just because this technique worked once, doesn't mean that it will always work. It is part and parcel of being a gardener and it is one of the more exciting facets of this never ending quest. A garden is a living thing and as such, is never truly done. Even the so-called perfect garden begs to be tinkered with and improved upon. And there is always that recalcitrant plant that either refuses to thrive or just plain croaks. Spring comes too soon, too late or not at all. It rains too much; it rains too little and it rains over there and not here. It's a challenge to keep the weather in check, even when we enlist Divine Authority by prayer, dance, song or invective. With most other arts, there is an end-point. Paint a picture and sooner or later, you frame it and put it on the wall. Write an essay and after you've edited it till your blue in the face, you send it off to be published. Not so a garden. Even if you do it perfectly (and how often does that happen? ), sooner or later, you know you will tear it all out and start again. A garden is really never done. A with all life, it's a never ending evolution. I hope some permaculturists morph into open minded gardeners and I hope that open minded gardeners will learn and incorporate ideas from permaculture. We need to be part of the same thrust to feed the world and to preserve the green spaces for everyone and progress towards a more viable agriculture all the way around. We have all seen the Thomas Jefferson quote, “Though an old man, I am but a young gardener,” and those of us who have gardened for a time, know that there is no Holy Grail. This year builds on last year. Practical experience is the way we all learn. I believe all gardens are like that. I totally agree with you saying that gardening is not only an art but it is also a science. Since I've never been good in both, I'm afraid to try this thing out. Gosh, it seems to me if you're interested enough in gardening to read an article on it, you might love it enough to allow your love to overcome your fear... Most good gardeners have killed more plants than bad gardeners if only because the 'good' gardeners stuck to it. If you have a community garden nearby, you could get a plot there - among experienced gardeners - and they'd be overjoyed to help you along. Gardening has to be learned by doing - I hope you get the chance.